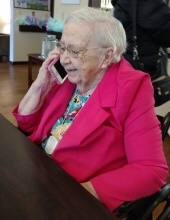 Dorothy Helen Ungaretti (nee Vibert), passed away on April 2, 2019 at the age of 94 years at Matthews of St Francis. A Mass of Christian Burial will be held on Tuesday, April 9, 2019, at 1:00 PM, at St. Francis Borgia North Catholic Church, 1375 Covered Bridge Rd, Cedarburg. A visitation will be held at the church, on Tuesday, from 12:00 PM until the time of Mass. The burial will take place following Mass at St. Francis Catholic Cemetery. In lieu of flowers, memorials to The Salvation Army are appreciated. Dorothy was born on March 22, 1925 in Fort Francis, Ontario, Canada to the late Herman Vibert and the late Belle Vibert (nee Welden). She later went on to marry the love of her life, Bruno John Ungaretti. Together they were blessed with two daughters, Marian “Sally” Soriano and Nancy Schultz. She lived and thrived in many places. Dorothy first followed her father’s career as an oil field supervisor, in Wyoming and Montana. She then went on to a World War II crash course in nursing, in several hospitals in Montana. Later she followed her husband’s ambitions which took them to many different states such as Montana, Illinois, Idaho, Arizona and Florida. Finally, she followed her daughters to Wisconsin, starting in Mequon and moving around the state to eventually end up in St Francis. Dorothy loved to spend time with her family, nurturing the young and the old. From early on she was the sounding board for all of her many nieces and nephews. In the 1990’s she was simultaneously nursing her husband through strokes, her mother through elder care and her daughter through multiple sclerosis all while supporting three grandchildren. Everyone who knew her respected how she nurtured her family, and honored her with the title “Ma”. Dorothy is primarily known through her family. Those beyond her family know her as a gracious woman who always had a smile, especially when she won at bingo! She is survived by her daughter, Marian “Sally” Soriano and Nancy Schultz, both of St Francis, WI, Grandchildren: Jackie DeSpirito (nee Schultz) of Waldorf, MD, Alan Soriano of Sussex, WI, and Alice Day (nee Soriano) of Bloomington, IN; Great-grandchildren: Lexie, Sydney, Caedman and Kelsey Day and Abby Soriano. Dorothy is further survived by nieces, nephews, other relatives and friends. To send flowers or a remembrance gift to the family of Dorothy Helen Ungaretti (nee Vibert), please visit our Tribute Store. Pioneer Rd. Just west of Wauwatosa Rd. "Email Address" would like to share the life celebration of Dorothy Helen Ungaretti (nee Vibert). Click on the "link" to go to share a favorite memory or leave a condolence message for the family. 979 N. Green Bay Rd.